Beginning with the invasion of Poland during World War II, the regime of Nazi Germany set up ghettos across occupied Europe in order to segregate and confine Jews, and sometimes Romani people, into small sections of towns and cities furthering their exploitation. 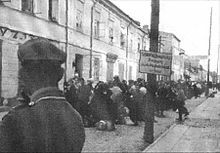 In German documents, and signage at ghetto entrances, the Nazis usually referred to them as Jüdischer Wohnbezirk or Wohngebiet der Juden, both of which translate as the Jewish Quarter. There were several distinct types including open ghettos, closed ghettos, work, transit, and destruction ghettos, as defined by the Holocaust historians. In a number of cases, they were the place of Jewish underground resistance against the German occupation, known collectively as the ghetto uprisings. The first anti-Jewish measures were enacted in Germany with the onset of Nazism, without the actual ghettoization planning for the German Jews which was rejected in the post-Kristallnacht period. However, soon after the 1939 German invasion of Poland, the Nazis began to designate areas of larger Polish cities and towns as exclusively Jewish, and within weeks, embarked on a massive programme of uprooting Polish Jews from their homes and businesses through forcible expulsions. The entire Jewish communities were deported into these closed off zones by train from their places of origin systematically, using Orpo battalions, first in the Reichsgaue, and then throughout the Generalgouvernement territory. The first ghetto of World War II was established on 8 October 1939 at Piotrków Trybunalski (38 days after the invasion), with the Tuliszków ghetto established in December 1939. The first large metropolitan ghetto known as the Łódź Ghetto (Litzmannstadt) followed them in April 1940, and the Warsaw Ghetto in October. Most Jewish ghettos were established in 1940 and 1941. Subsequently, many ghettos were sealed from the outside, walled off with brickwork, or enclosed with barbed wire. In the case of sealed ghettos, any Jew found leaving there could be shot. The Warsaw Ghetto, located in the heart of the city, was the largest ghetto in Nazi occupied Europe, with over 400,000 Jews crammed into an area of 1.3 square miles (3.4 km2). The Łódź Ghetto was the second largest, holding about 160,000 people. According to the United States Holocaust Memorial Museum archives, there were at least 1,000 such ghettos in German-occupied and annexed Poland and the Soviet Union alone. Ghettos across Eastern Europe varied in their size, scope and living conditions. The conditions in the ghettos were generally brutal. In Warsaw, the Jews, comprising 30% of the city overall population, were forced to live in 2.4% of the city's area, a density of 7.2 people per room. In the ghetto of Odrzywół, 700 people lived in an area previously occupied by five families, between 12 and 30 to each room. The Jews were not allowed out of the ghetto, so they had to rely on smuggling and the starvation rations supplied by the Nazis: in Warsaw this was 253 calories (1,060 kJ) per Jew, compared to 669 calories (2,800 kJ) per Pole and 2,613 calories (10,940 kJ) per German. With the crowded living conditions, starvation diets, and insufficient sanitation (coupled with lack of medical supplies), epidemics of infectious disease became a major feature of ghetto life. In the Łódź Ghetto some 43,800 people died of 'natural' causes, 76,000 in the Warsaw Ghetto before July 1942. To prevent unauthorised contact between the Jewish and non-Jewish populations, German Order Police formations were assigned to patrol the perimeter. Within each ghetto, a Jewish Police force was created to ensure that no prisoners tried to escape. In general terms, there were three types of ghettos maintained by the Nazi administration. Open ghettos did not have walls or fences, and existed mostly in initial stages of World War II in German-occupied Poland and the occupied Soviet Union, but also in Transnistria province of Ukraine occupied and administered by Romanian authorities. There were severe restrictions on entering and leaving them. Closed or sealed ghettos were situated mostly in German-occupied Poland. They were surrounded by brick walls, fences or barbed wire stretched between posts. Jews were not allowed to live in any other areas under the threat of capital punishment. In the closed ghettos the living conditions were the worst. The quarters were extremely crowded and unsanitary. Starvation, chronic shortages of food, lack of heat in winter and inadequate municipal services led to frequent outbreaks of epidemics such as dysentery and typhus and to a high mortality rate. Most Nazi ghettos were of this particular type. The destruction or extermination ghettos existed in the final stages of the Holocaust, for between two and six weeks only, in German-occupied Soviet Union (especially in Lithuania and Ukraine), in Hungary, and in occupied Poland. They were tightly sealed off. The Jewish population was imprisoned in them only to be deported or taken out of town and shot by the German killing squads, often with the aid of local collaborationist Auxiliary Police battalions. The parts of a city outside the walls of the Jewish Quarter were called "Aryan". For example, in Warsaw, the city was divided into Jewish, Polish, and German Quarters. Those living outside the ghetto had to have identification papers proving they were not Jewish (none of their grandparents was a member of the Jewish community), such as a baptism certificate. Such documents were sometimes called "Christian" or "Aryan papers". Poland's Catholic clergy massively forged baptism certificates, which were given to Jews by the dominant Polish resistance movement, the Home Army (Armia Krajowa, or AK). Any Pole found by the Germans to be giving any help to a Jew was subject to the death penalty. In 1942, the Nazis began Operation Reinhard, the systematic deportation of Jews to extermination camps. Nazi authorities throughout Europe deported Jews to ghettos in Eastern Europe or most often directly to extermination camps built by Nazi Germany in occupied Poland. Almost 300,000 people were deported from the Warsaw Ghetto alone to Treblinka over the course of 52 days. In some ghettos, local resistance organizations staged ghetto uprisings. None were successful, and the Jewish populations of the ghettos were almost entirely killed. On June 21, 1943, Heinrich Himmler issued an order to liquidate all ghettos and transfer remaining Jewish inhabitants to concentration camps. A few ghettos were re-designated as concentration camps and existed until 1944. Wikimedia Commons has media related to Ghettos in occupied Europe 1939-1944. ^ Yad Vashem, "The Ghettos". The Holocaust Martyrs' and Heroes' Remembrance Authority. Overview. Retrieved 28 September 2015. ^ a b c Holocaust Encyclopedia (2014). "Ghettos. Key Facts". United States Holocaust Memorial Museum. Archived from the original on August 15, 2012. Retrieved 28 September 2015 – via Internet Archive. ^ Browning 2007, pp. 166, 172. ^ Browning 2007, p. 139, Gold rush. ^ Volker R. Berghahn (1999). "Germans and Poles 1871–1945". Germany and Eastern Europe: Cultural Identities and Cultural Differences. Rodopi. p. 32. ISBN 9042006889. ^ "First Jewish ghetto established in Piotrkow Trybunalski: October 8, 1939". Archived from the original on January 6, 2009. Retrieved June 1, 2016. . Yad Vashem The Holocaust Martyrs' and Heroes' Remembrance Authority. ^ a b c d Types of Ghettos. United States Holocaust Memorial Museum, Washington, D.C.
^ Browning 2007, pp. 149, 167: Sanitation. ^ Isaiah Trunk; Robert Moses Shapiro (2006). Łódź Ghetto: A History. Indiana University Press. p. 223. ISBN 0253347556. Retrieved 29 September 2015. ^ Gunnar S. Paulsson, "The Rescue of Jews by Non-Jews in Nazi-Occupied Poland", The Journal of Holocaust Education, vol. 7, nos. 1 & 2 (summer–autumn 1998), pp. 19–44. ^ Tadeusz Piotrowski (2007). Poland's Holocaust: Ethnic Strife, Collaboration with Occupying Forces, and Genocide in the Second Republic, 1918–1947. McFarland. ISBN 978-0-7864-2913-4. ^ Niewyk, Donald L.; Nicosia, Francis R. (2000). The Columbia Guide to the Holocaust. Columbia University Press. p. 114. ISBN 978-0-231-11200-0. Megargee, Geoffrey P., ed. (2012). Encyclopedia of Camps and Ghettos, 1933–1945. in association with United States Holocaust Memorial Museum. Bloomington: Indiana University Press. ISBN 978-0253355997. Browning, Christopher R. (2007) . The Origins of the Final Solution: The Evolution of Nazi Jewish Policy 1939-1942. Lincoln: University of Nebraska Press. ISBN 0803203926.